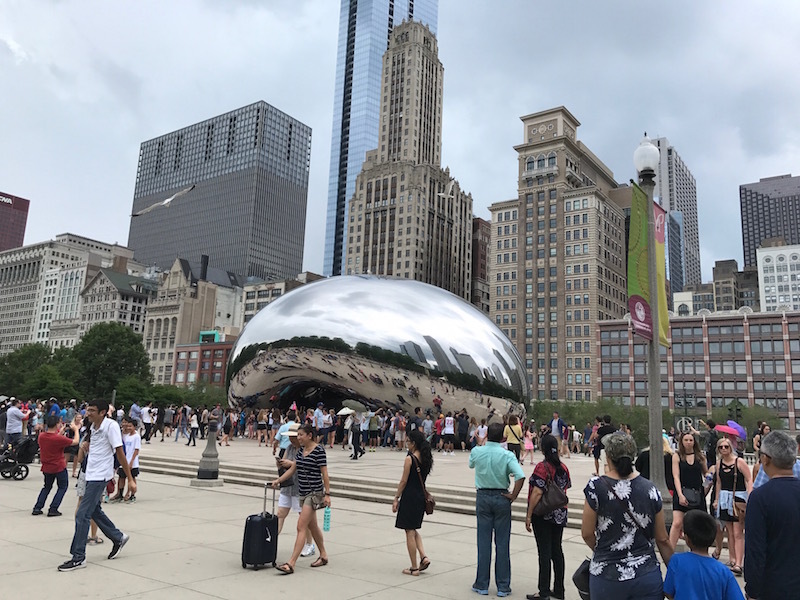 Want to make the most of limited time in Chicago? 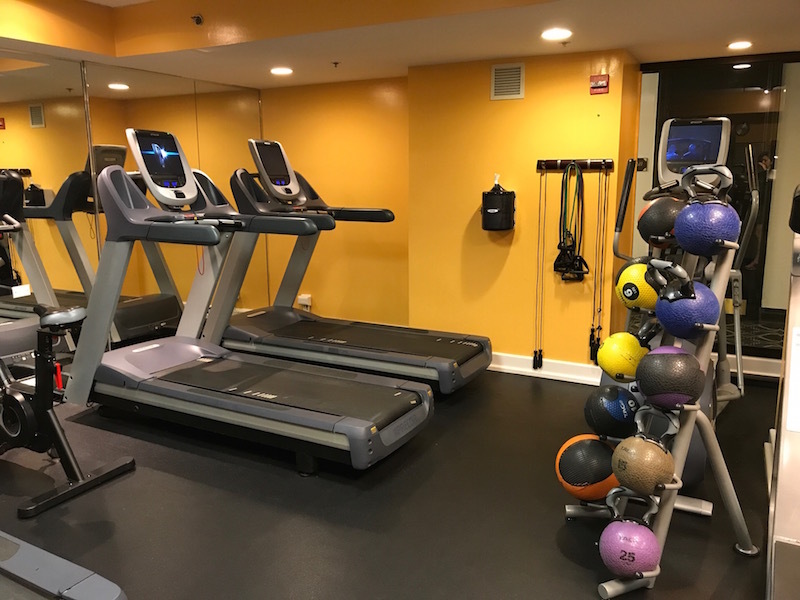 If you have a quick Chicago trip, Vegetarian TravelingMom Judy Antell suggests a stay at the convenient and amenity -loaded Kimpton Hotel Allegro. From free bikes and evening wine hours to an El stop a block away, this hotel in the Loop has it all. 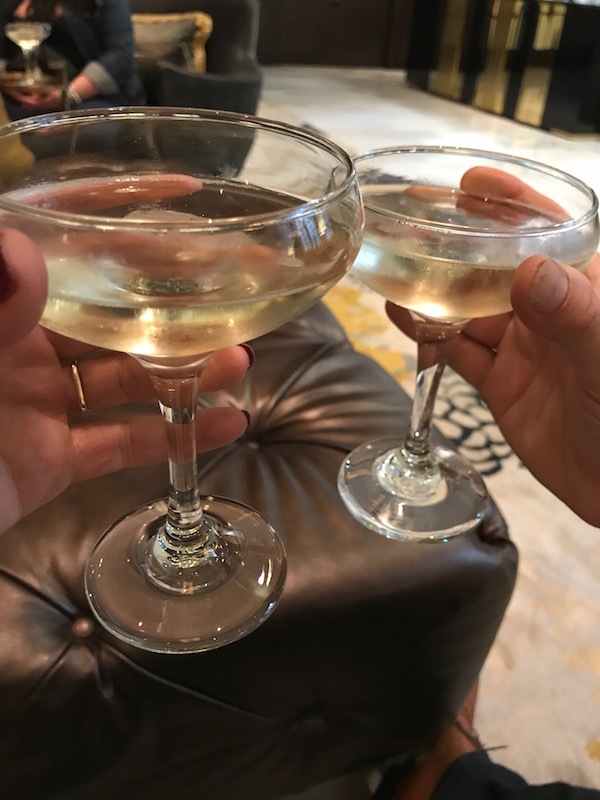 On a recent trip to Chicago, Illinois, my husband and I hit the ground running. 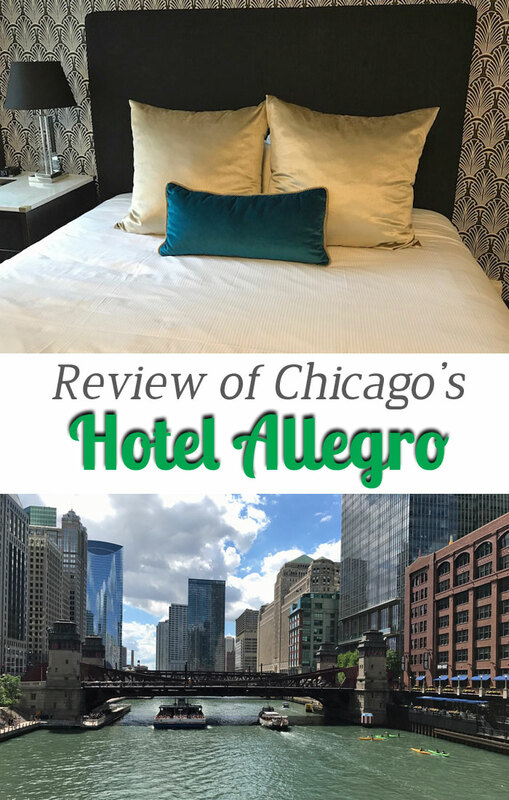 We arrived on a Saturday morning, took a quick trip into the loop on the El and checked into the Kimpton Hotel Allegro. We had lunch reservations at a vegetarian restaurant and grabbed a couple of the free bikes for the short ride to lunch. 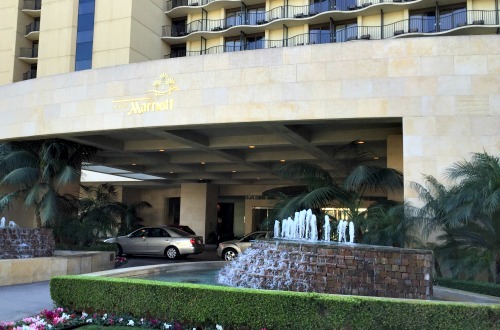 All Kimpton hotels provide free bikes, but some have only two. The Hotel Allegro had about a dozen. 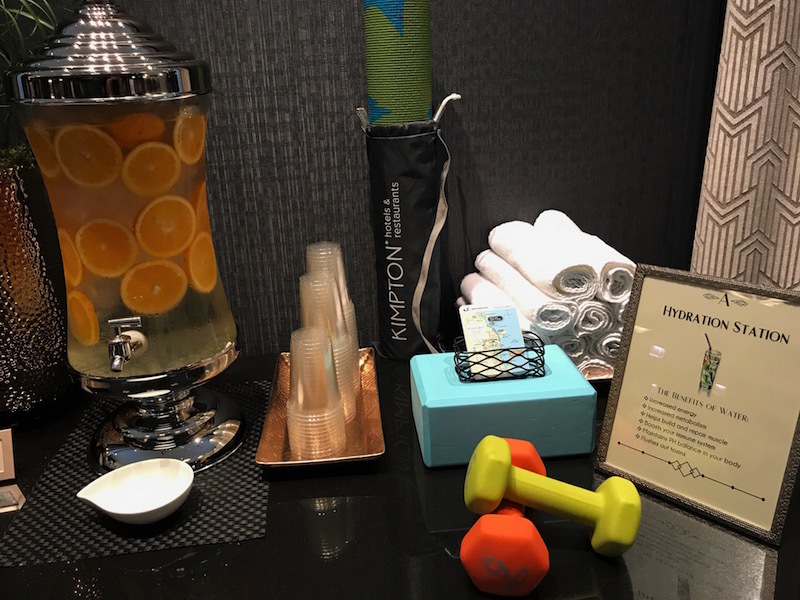 The hotel also has a hydration station, with fruit-infused water, in the lobby. In the morning, there are towels and running routes if you want to head out on foot. We ran along the Riverwalk, where several companies offer boat tours and kayak rentals. There are also bars and restaurants along the water. 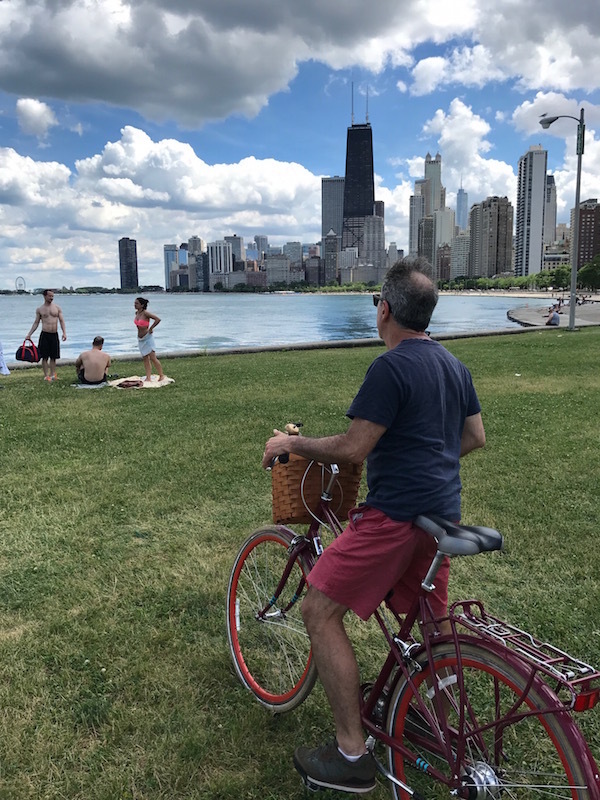 We used the Kimpton bikes to ride along the Chicago Lakefront Trail, which runs for 18 miles. There are several beaches on the route, along with Navy Pier, home to the giant Ferris Wheel. The bike path also take you to the free Lincoln Park Zoo. Millennium Park is only a couple of blocks away from the hotel, along with The American Writers Museum. We walked to the just-opened museum, ignoring the threatening clouds and the umbrellas in our room. Of course, it poured when we were halfway to the museum. On any Chicago trip, you have to be prepared for sudden changes in weather. The museum is great for the whole family. 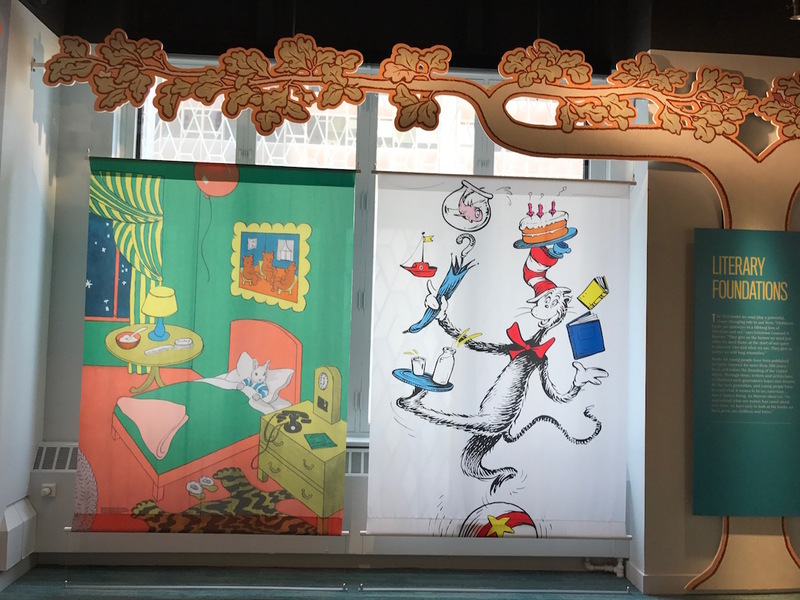 There is a children’s literature gallery, and interactive displays throughout. You can use an actual manual typewriter and hang a page of your literary output on the wall. We enjoyed testing ourselves on the opening lines of novels and seeing the diverse writers celebrated, from Arthur Miller to Tupac Shakur. 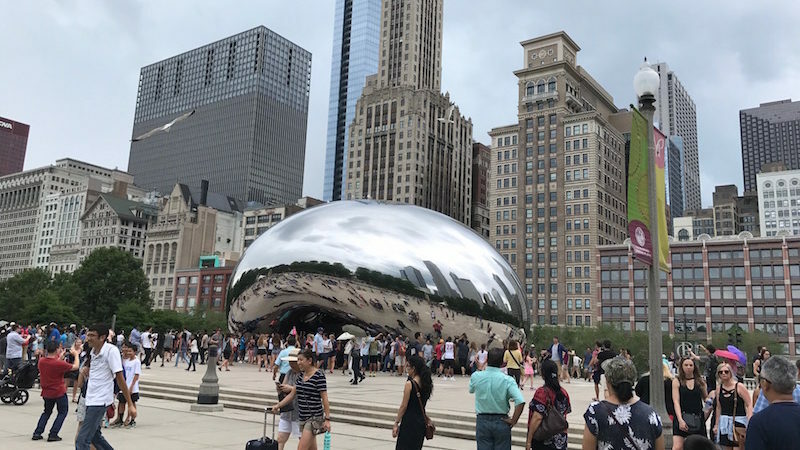 Millennium Park has free exercise classes in summer on Tuesdays, Thursdays and Saturdays, and a free Family Fun Festival daily through August 24, with music, arts and crafts and other activities. And don’t forget to snap a selfie at The Cloud Gate, aka the Bean. We had a king room, with a king-sized bed, mini bar with space for chilling a water bottle, and a yoga mat. The large bathroom had plenty of fluffy towels, slippers, robes and good lighting. 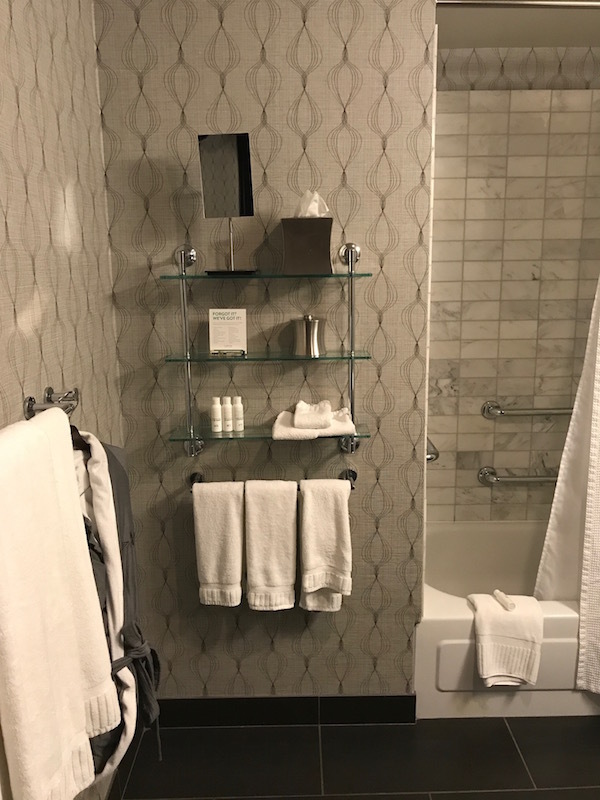 It could have used more towel hooks, though. The room was comfortable and quiet. We were right near the elevator, but never heard any elevator or hall noise. Or street noise, for that matter. The hotel is in the theater district, so if you arrive or leave around curtain time, streets and sidewalks are packed. The Italian born chef, Luca Corazzina, makes authentic northern Italian food at 312 Chicago. The Allegro Bar has all local beers on tap, along with snacks, salads and sandwiches. It looked lovely, but we had a date at The Violet Hour, a speakeasy in Wicker Park. Every Kimpton hotel has coffee in the lobby in the morning. This one also had iced coffee, for summer, and flavored syrups. You can also access a Starbucks through the ground floor; the lobby at the hotel is on the second floor. We rode the bikes to another lunch at Roister, a Grant Achatz restaurant that didn’t require a six month wait or a $275 ticket, as Alinea does. Note: I was given free admission to The American Writers Museum. Opinions expressed are my own.